The best part of a Greyhound cocktail is the fresh squeezed grapefruit juice - giving it a refreshing zip that acts as a perfect vessel to deliver vodka to one's body. The Greyhound is a classic cocktail, one that never fails. Today, we're bringing you a variation on the Greyhound - The Bad Dog Greyhound. A perfect cocktail for the bad, the fiery, the untamed. 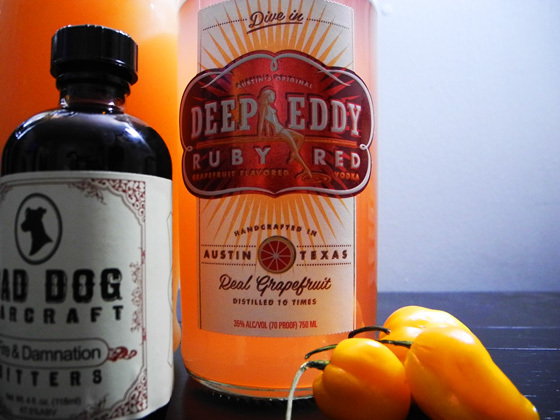 We used Deep Eddy Ruby Red Grapefruit Vodka made in Austin Texas, Fresh Grapefruit Juice, and Bad Dog Fire and Damnation bitters to give it some serious kick. We rimmed the glass in salt and Rio Grande Chile Blend, and garnish with a whole Habanero Pepper - for the baddest dogs out there. One a plate, mix the salt and chile powder. 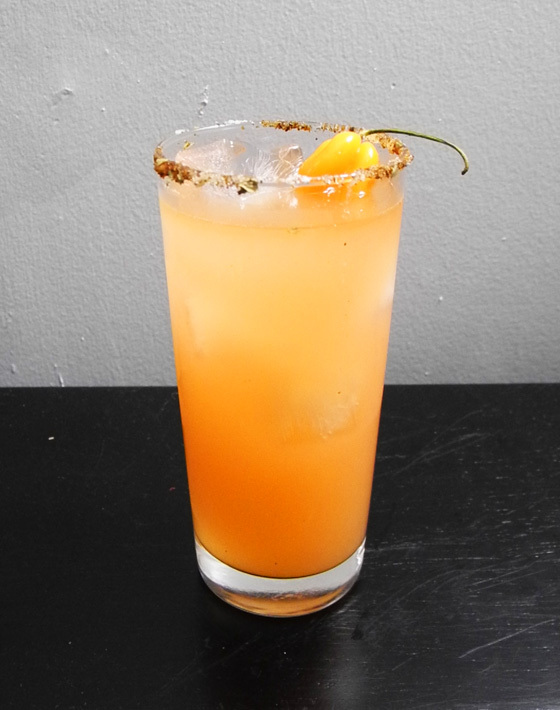 Rim glass edge with a slice of lime, and gently dip into your salt and chile powder mix coating the rim of the glass. Shake vodka and grapefruit juice with ice, and strain into a highball glass filled with cubed ice. 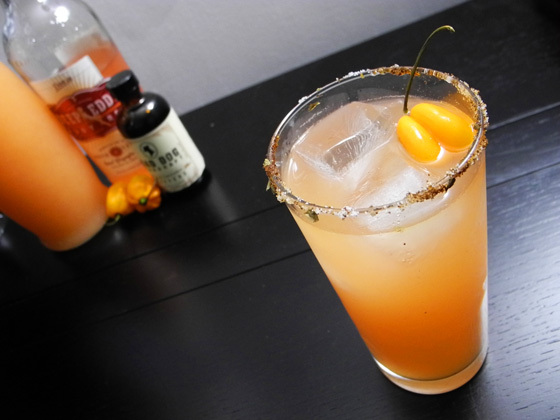 Garnish with a whole Habanero Pepper. Cheers, you bad dog, you. This is the second time in a couple days that I have seen this real Texas grapefruit juice .. must find, need me a bad dog cocktail!